Congratulations, RMIT! I was dancing at my dinner table on Monday, 15 June. No, I was not out on the town. Instead, I was opening the day’s mail and RMIT’s direct mail piece caught my eye for all the right reasons. RMIT makes an ask. Seem basic to you? Many charities in my direct marketing study do not make an ask or, if they do, it is such a soft ask it is missed. RMIT asks for enhanced data – phone and email. 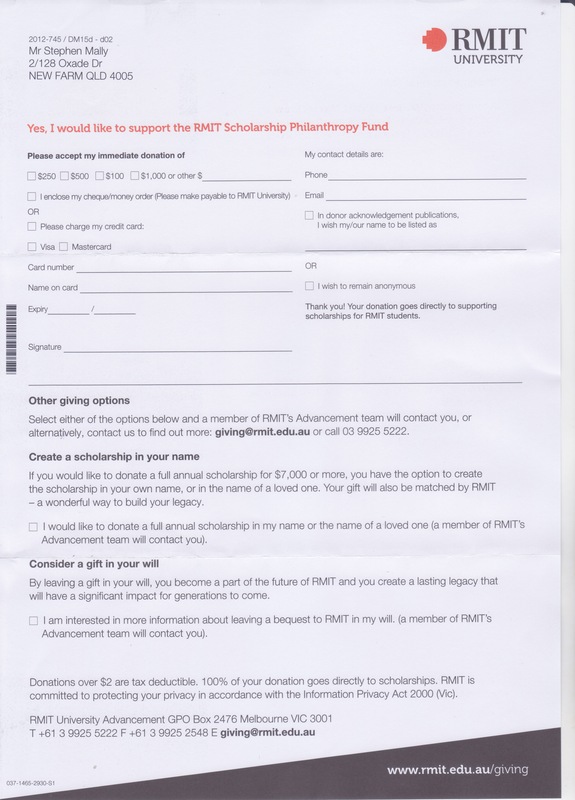 RMIT asks how I wish to be recognised in donor publications or if I wish to remain anonymous. Creation of a scholarship in my name. Consideration of a gift in my will. RMIT references the Information Privacy Act 2000 (VIC). RMIT offers matching my donation dollar for dollar. As RMIT says in the letter, giving to education is powerful. I’m convinced. And, RMIT does a great job enticing me to give. The RMIT scholarship solicitation is a model appeal.